Purchase BMW Bike: Receive $100 towards purchase of bike rails. It's time to shed the winter gear and get ready for the long bike rides and adventures we have all been dreaming of during the winter season. Get yourself equipped for spring with a BMW Bike and receive $100 towards the purchase of a BMW Bike Rail. Like all vehicles produced by the BMW Group, the 2014 bicycle collection meets top standards in quality and design. The design of this new third-generation frame gives the bicycle’s functional geometric shape a stylish and dynamic look. The signature feature of the bikes in the collection is the “bull neck” on the front of the top tube. The frame is reminiscent of a motorbike, tracing the outline of the tank. The welding lines are smooth and all cables run inside the frame. 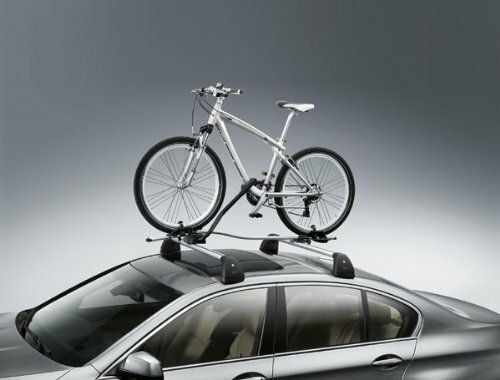 Securely transport your bicycle with an official BMW Bike Rail. BMW Bike Rails are designed with the highest standards in quality and safety thanks to its sturdy construction and lock system that protects against theft. To purchase your BMW Bike and BMW Bike Rails, give us a call at (416) 444-4269 for the parts department, or visit our lifestyle boutique in store located at 1155 Leslie Street, Toronto ON. If you would like a parts request, click the button below.